Challenge: Imagine this project in as many ways as you can. *Please refer to the Original Case Statement for reference. This shows exactly how exhibits and interactions would be imagined in a full-scale production of this concept. I favor the triangle or outward tri-fold. The triangular shape provides a compact display, with housing on the inside for components and electronics. The outward trifold offers a spread out, yet compact display with more space in the center backstage for the possibility of building out the concept of the Writers Room and having script filing cabinets that can be built into the wall. It also offers the side walls privacy, separating each wall’s experience from the other (same goes for the triangular set-up. 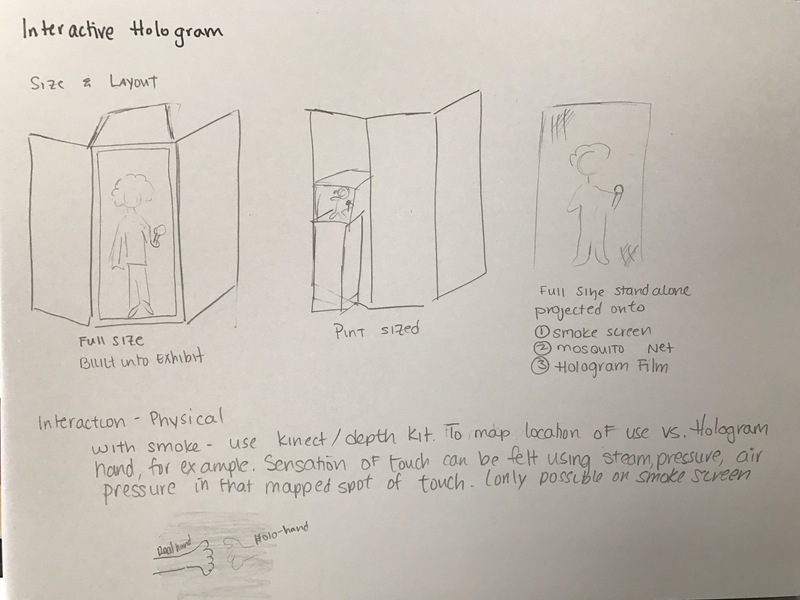 For projections and holograms (discussed later) I can add an extension using a smoke/fog wall, mosquito screen or hologram film. 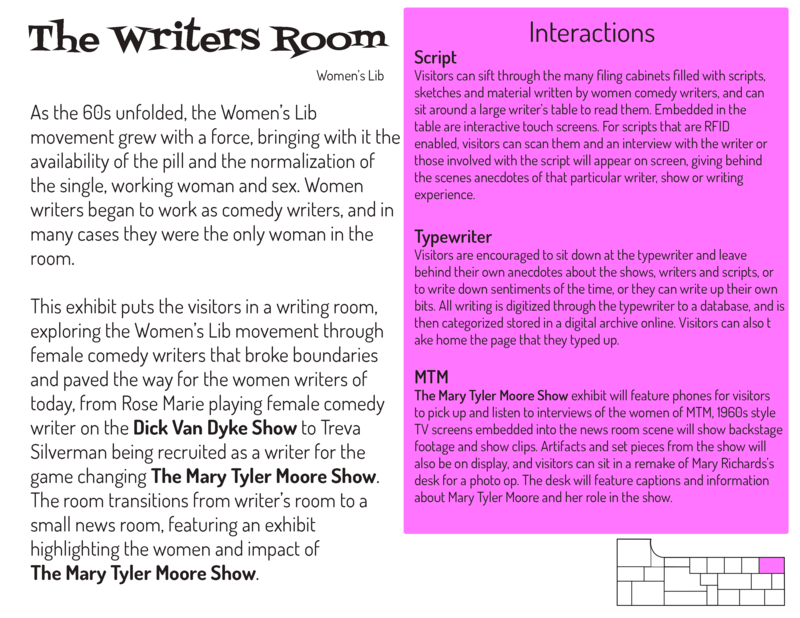 It is clear that I keep circling back to the idea of the Writers Room – an exhibit that focuses on women writers making groundbreaking waves in the comedy world during the women’s lib era. It is also set around The Mary Tyler Moore Show*, which I believe is the apex of this era of comedy. 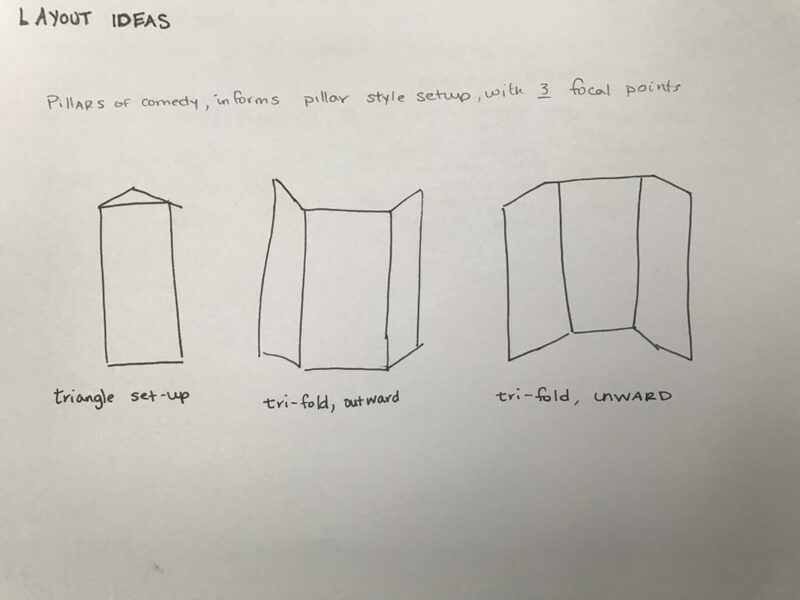 * Just for quick reference, here are the original design plans for it. I enjoy the idea of visitors exploring endless cabinets of scripts and written content, in a news room or research room setting. It is a point of the experience where they can sit down, take their time, relax, read and absorb information in a a way that breaks the pace of the rest of the museum setting. I want to find a way to incorporate this era, with these women, into this experience. In a Writers Room style experience, one way to display the content in an interactive way would be through Augmented Reality (AR). This can pull in more content into less space. In this experience, visitors would approach the filing cabinet full of scripts and bits written of, by and for women. 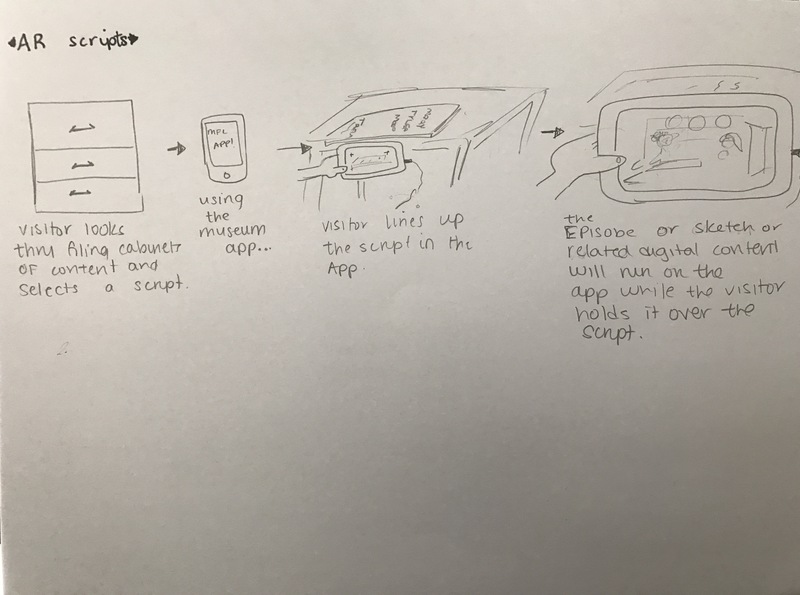 Using an app designed for this experience, visitors can place the script on a table and hold up their smart devices to the script while running the app (headphones needed). The show or sketch or bit will appear in real time above the script in AR form. 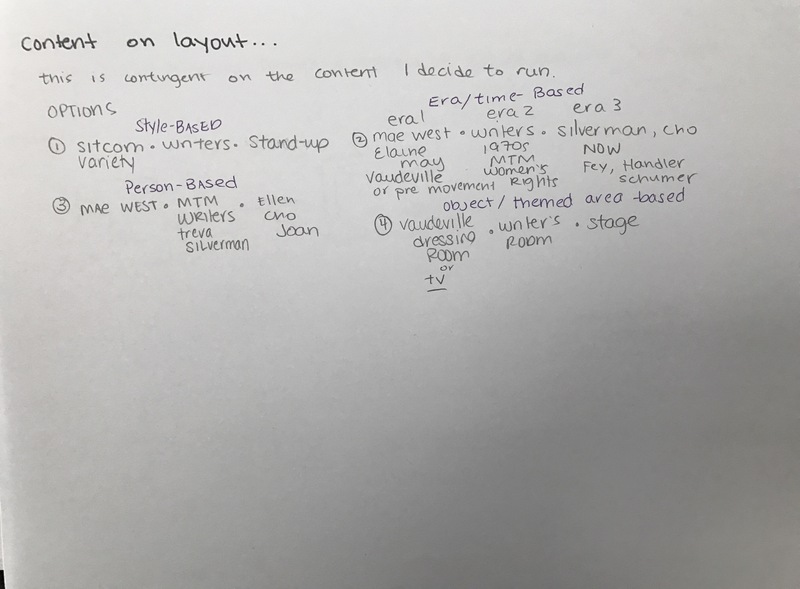 Instead of the show or bit, an interview or other visual featuring the actress or writer will appear above the script in AR form. In an ideal world, I would be able to cultivate objects and artifacts for display, including wigs, costumes, pens, papers, scripts, original set pieces, etc. However, it will be extremetly difficult to obtain such objects. And even if I did, there is no space. 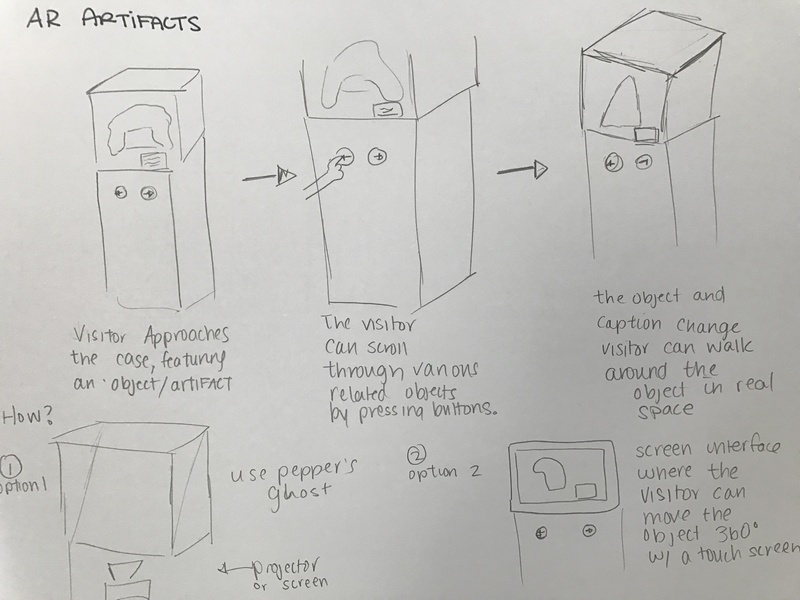 So, to answer this challenge of getting objects and keeping them in a compact space, I can certainly find a way to display an interactive cabinet that features 3D scanned or pepper’s ghosted objects related to the content. I can show how this could pan out through the Variety of Women exhibit. This is just as an example and the same technology and experience can be applied at to any content in this exhibit. Here is the wig of Roseanne Rosannadanna in a case. 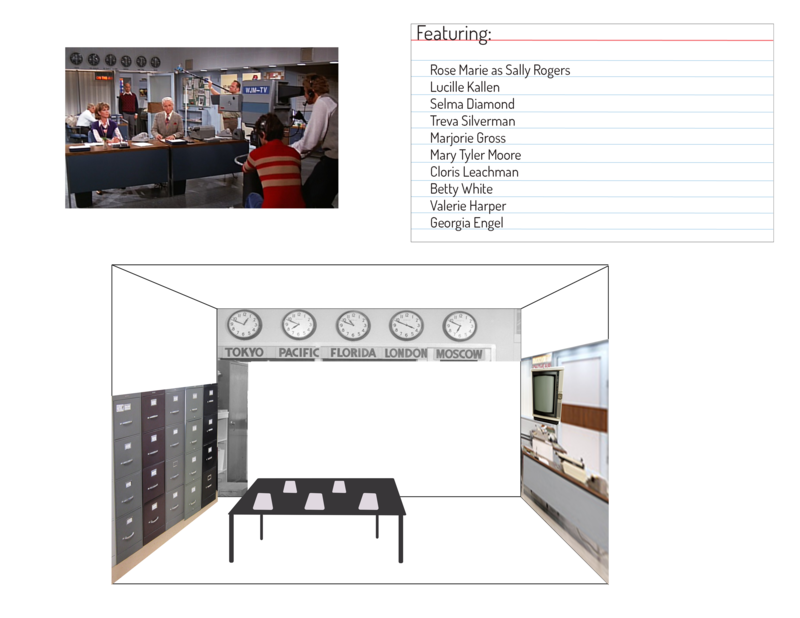 However, if I can create 3D models or projected visuals of many artifacts from SNL (in this particular scenario of content), in a way that visitors can interact with and scroll through the artifacts, this will bring layers of content into a minimum amount of space. I might also be able to convince the powers that be to allow me to use a digital footprint of their artifacts instead of the actual objects themselves. Haptic experiences: If you wanted to shake hands with Phyllis Diller, you could. Or at least I wanted to experiment with that. Interactive Conversations: You could have a conversation with the hologram that uses speech recognition and old interview or set footage ( or possibly a new interview that I can shoot an interview with a living comedian) as the reactionary content. See Good Boy, Sammy for proof of concept on this tech. Originally I had planned on a full-size hologram, but based on the space, I could also scale it down. What if the interactions were through an old television set, and the experience was that of being in an old-fashioned living room and using the television as a facilitation of the content. The visitor chooses a script (or other written artifact) from the filing cabinet of scripts written by female writers or starring female actors. It could even be note cards of stand-ups. The filing cabinets basically hold content written by women comedians or written for women comedians. 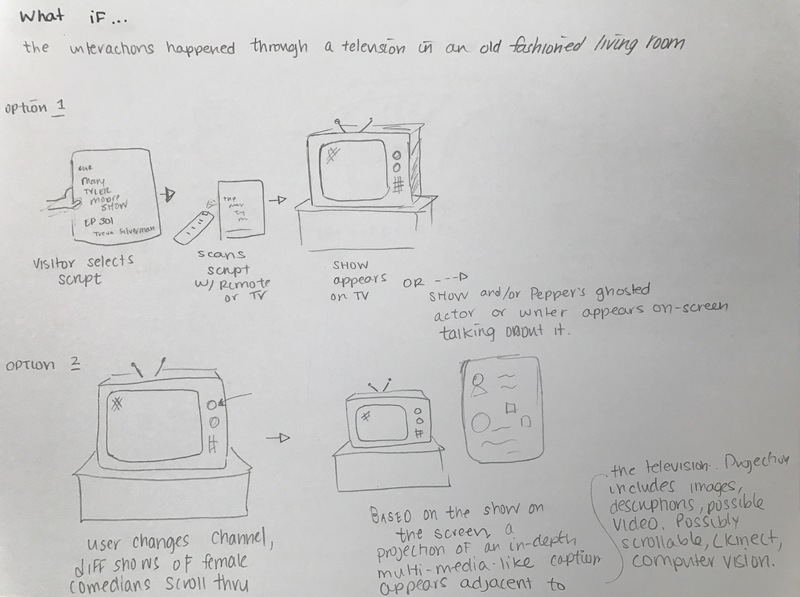 The user then approaches the TV (they can sit on the sofa or stand), but they will need to scan the script by laying it on top of the television, and the scan triggers a video of that script to play on the television either in the normal way or a pepper’s ghosted way. The show represented in the script and/or a pepper’s ghosted actor or writer from that show appears on-screen talking about that particular episode or show or piece. The user approaches the TV and changes the channel with the analog dials. Each channel airs a different show featuring a female comedian or show written by a female comedian, or an act of a female comedian. Based on the show featured on the screen, a projected caption appears adjacent to the television. The projection includes images, descriptions and possible video that tells the story of what is on screen imagery. 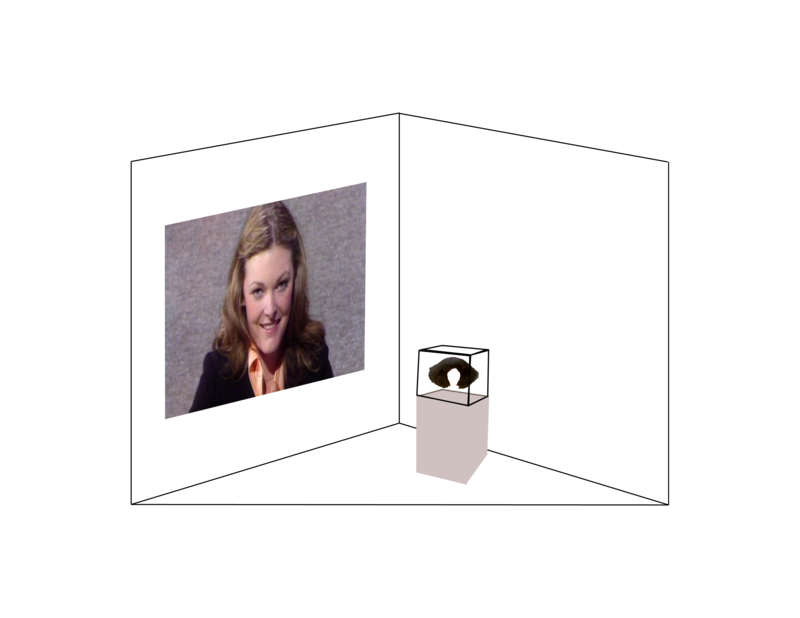 This projected caption might be scrollable, using kinect or computer vision (or the next best option). If sound is included in the projection, it would be set up so that if the user wanted to watch the TV show, they would need to wear head phones provided. Or I can use parametric sound to focus the sound to the proper users. *I have this theory that The Mary Tyler Moore Show is the point where all comedy past and future, meets. Almost like the 6 degrees of Kevin Bacon concept, all comedians, writers, shows, etc can all be traced back to The Mary Tyler Moore Show.